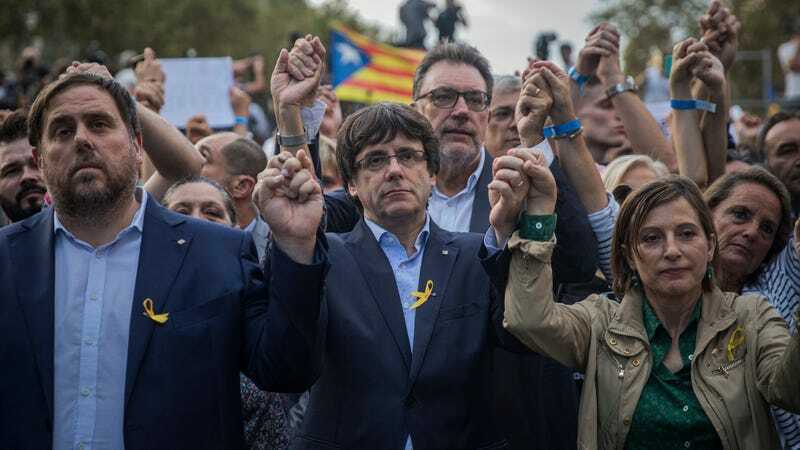 President Carles Puigdemont, center, with Vice President Oriol Junqueras, left. Via the AP. Spain has made its plot to take over the region of Catalonia official. Madrid Prime Minister Mariano Rajoy said that he will remove Catalonia’s President Carles Puigdemont, invoking a constitutional rule that Spain can take steps to stop any region which “acts in a way that is seriously prejudicial to the general interest of Spain.” The region has been in an uproar since the violent October 1st referendum for independence in which dozens of photos and videos showed riot police beating voters and shooting rubber bullets into the crowd. They carried away this old lady. It looks a lot like they broke this woman’s fingers. 761 people were reportedly injured. According to the Guardian, 90 percent of voters who turned out that day voted for independence. Catalan Vice President Oriol Junqueras called Rajoy’s plan “totalitarianism.” Before the October 1st vote, the UN human rights council condemned Spain’s aggression as a violation of democratic rights. Catalonia, a key economic generator which includes Barcelona, and a region with its own Parliament and President, has debated sovereignty for decades. On Friday, Catalonians withdrew around $188 from banks in protest. Spain has also promised to take over Catalonia’s public TV station, which sounds...sinister. The Spanish Senate will vote on whether to remove Puigdemont and suspend the region’s autonomy next week. They are expected to vote in favor, the New York Times reports.